AYWARD TENDRILS – A Wine Book Collector's Society – was formed in 1990 by, and for, lovers of wine literature. 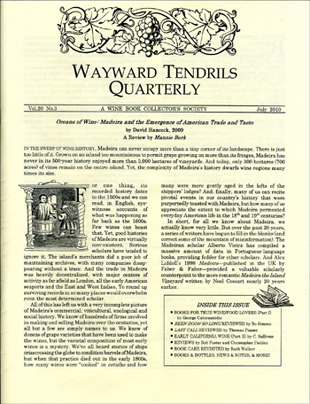 Under the direction of Gail Unzelman, the Society published its Wayward Tendrils Quarterly for 25 years. Our noble journal has provided members a "Premier Cru Harvest" of informative and entertaining articles on all aspects of collecting wine-related books and ephemera – biographical and bibliographical essays on the authors and their books; checklists of author publications, “Fine Press” wine books, miniature wine books and wine fiction; guides to collection development and collection care; book reviews; lists of member “wants” and “duplicates,” news and notes of the wine book world, and much more. With the final issue in October 2015 (vol. 25 #4), the Quarterly and Society were “retired,” but our WT webpage and email address will remain active. Searchable Indexes of all WTQ articles and WTQ Volumes 1–25 (1991–2015) are available on our webpage to peruse or download. IN ADDITION TO OUR NOTEWORTHY Quarterly, the Wayward Tendrils has produced two exciting publications: “Wrapped in Vines & Cast in Lead,” a limited edition broadside, and “Wine in California … 1698–1846,” a record of the earliest days of California wine by Charles L. Sullivan. For a limited time we have a Special Offering of a very few copies of “The Wine of Santa Cruz Island” by noted wine historian Thomas Pinney. We are also pleased to offer our complimentary online publications: “Wine and Gastronomy” a bibliographic catalog by Eberhard Buehler; “The Saga of Vintner Martin Ray” by Barbara Marinacci; “Thomas Hart Hyatt: The Man and His Book” a biographical / bibliographical essay by Gail Unzelman, A Set of Seven “Viticultural District Histories” by historian Ernest P. Peninou (1916-2002) and Gail Unzelman, and Charles Sullivan's unpublished manuscript “Wine in California: The Early Years”. See Index Vol.20 – Vol.25.